People love trucks, specifically pickup trucks. We may not all agree on everything but as a collective motoring consciousness everyone seems to love that uniquely American vehicle invention, the pickup truck . At one point in our life we’ve either owned, drove, or knew someone who had a pickup. They are so ingrained in our society that for many years now pickup trucks have outsold every other type of vehicle. Sedan, coupe, SUV, crossover, minivan, all sell behind the good old pickup. While some of those sales can be a attributed to fleets, the fact remains that if you take a trip down any suburban street chances are you’ll spy a pickup or two, maybe three. The Ford F-150 has been the number one seller for several years followed by Chevy and Ram, which despite its efforts to drop its Dodge moniker, is in fact made by Dodge. In the past year, we had the good fortune to drive an F-150 and a Silverado. Recently we had the chance to live with a Ram for a week making our testing of the three top selling vehicles in America complete. Our model for the week was the 1500 Laramie crew cab, 4X2, a light duty truck with the shortest of the three available beds (5’ 7”). 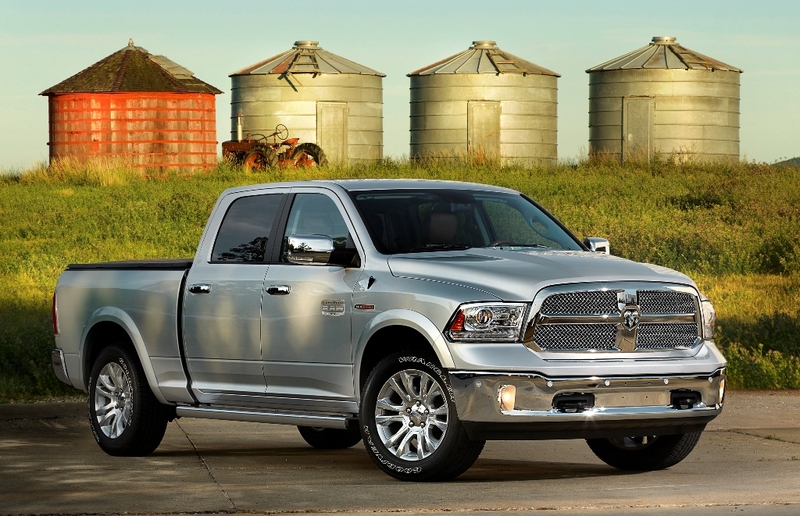 The full size Ram 1500 is available in multiple body styles. The regular cab seats three and can be had with a 6-foot, 4-inch or 8-foot cargo bed. The Quad Cab can seat up to six and comes only with the 6-foot-4 bed. The crew cab gives you more rear-seat legroom and comes with either a 5-foot-7 or 6-foot-4 bed. There are six main trim levels: Tradesman, Express, HFE, SLT, Sport and Laramie. The Tradesman is the least expensive and the one most often seen on a work-site. The Express is the next level and adds a few more features to the mix. The HFE (high fuel efficiency) model is next and for 2015 offers the diesel engine .The SLT is one of the more popular trims, but the Big Horn-Lone Star variant is the top seller and has few more upgrades above the SLT. The Outdoorsman and Sport trims appeal to niche truck buyers, as does the new-for-2015 R/T option, which is part of the Sport trim. All three of the luxury trims—Laramie, Laramie Longhorn, and the new Laramie Limited—are meant to attract those full-size buyers who are looking for a little more style inside and out. As you move up the trims, you start adding more features. By the time you get to the Sport level there are 20-inch wheels, auto-dimming power-folding mirrors with puddle lamps and integrated turn signals, projector headlights with LED accents and smoked lenses, LED taillights, LED interior lighting. Inside there are heated front bucket seats with driver power adjustments, upgraded upholstery, a heated leather-wrapped steering wheel, a touchscreen driver information display, a full center console, power-adjustable pedals, dual-zone automatic climate control (except regular cab). Electronics upgrades include the Uconnect Access smartphone integration and WiFi hotspot capability an SD-card slot, a rearview camera and an 8.4-inch touchscreen interface. The Laramie model we had featured chrome exterior trim, clear headlight lenses and includes most of the Sport’s upgrades, adding chrome-accented 20-inch wheels, two-tone paint, leather upholstery, ventilated leather-trimmed front seats (vinyl rear seats), driver memory functions, a power passenger seat and a 10-speaker Alpine surround-sound audio system. Another exterior feature we found pretty cool we had were the “RamBox” weatherproof bedside bins that are a stand-alone option on models with the 5-foot-7 and 6-foot-4 beds (except the HFE). 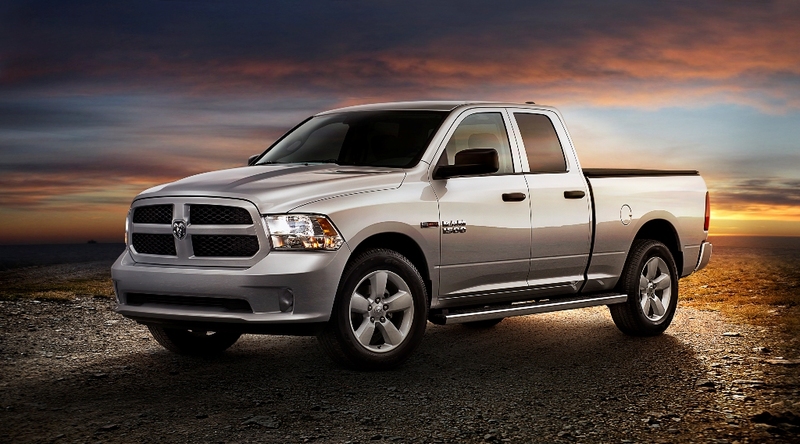 The base engine in the 2015 Ram 1500’s is a 3.6-liter gasoline V6 producing 305 horsepower and 269 pound-feet of torque. There is also a 5.7-liter HEMI V-8 with 395 horsepower and 410 lb.-ft. of torque. Finally there is a 3.0-liter turbocharged V-6 EcoDiesel with 240 horsepower and 420 lb.-ft. of torque. No matter the engine the engines are mated to an eight-speed automatic. As is typical in other Dodge products the traditional shift lever is replaced by a rotary knob on the instrument panel. The two-wheel rear-wheel-drive layout is standard, but there are two four-wheel drive systems. For 2015, the SLT (with Luxury Group) and Laramie get a new instrument panel welcome screen with high-quality, model specific digital graphics. The overall interior is well laid out with enough interior storage to carry a house and room enough for even an NBA player. 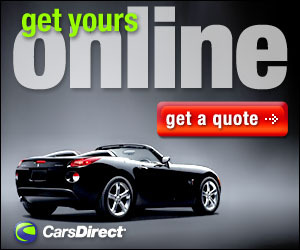 The Uconnect system is one of our personal favorites of the infotainment systems. We had the upgraded 8.4 touchscreen that was easy to navigate and use. Honestly, the 10-speaker Alpine surround-sound audio system is one of the best we’ve had, in any vehicle we’ve tested, and that’s saying something. It seems that in some vehicles the sound system is almost an afterthought. 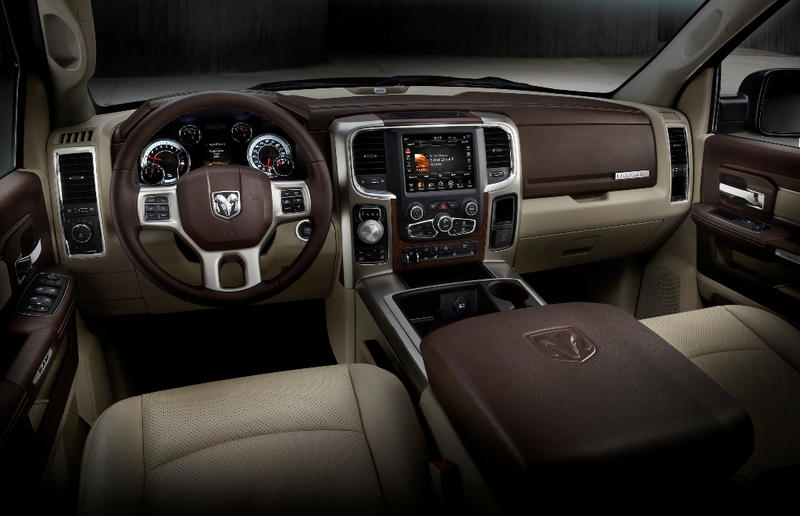 In the Ram, one could almost picture an audiophile engineer sitting in the seat and saying “sounds perfect” before signing off on the sheet. Our model had the base 3.6-liter V6 and frankly we found it to be very capable for tooling around the roads of Central Florida. There was plenty of power and no noticeable hesitation under heavy acceleration. There was a noticeable difference in the three trucks we’ve tried: On the road the Ram is easily the quietest, smoothest driving of the bunch. Maybe it’s Ram’s class-exclusive coil-spring rear suspension, but whatever the reason the drive and the ride are very comfortable. Here’s the dilemma a truck buyer faces: All three of the top selling trucks have their good points. The F-150 has a great ergonomic cabin, the Silverado has a great deal of class, and the Ram, in our opinion, has the best ride. It comes down then to what a truck buyers needs are. Working, family, or both. The F-150 seems to be the choice for work, the Silverado seems best for doing the family thing. However, at the end of the day we can honestly say that in our minds at least, the Ram 1500 can do both. There’s enough room and comfort for everyone, not too much flash, and enough storage and towing capacity to get the job done. For those in the market for a truck there are three very good ones to choose from. However, for those whose focus is on doing the job and keeping a family happy, the Ram should be the first truck to look at. Front Head Room: 41.0 In. Front Hip Room: 63.2 In. Front Leg Room: 41.0 In. Front Shoulder Room: 66.0 In. Rear Leg Room: 40.3 In. Rear Shoulder Room: 65.7 In.